Groeger et al. showed that 16% of patients in medical ICUs and 27% of those in surgical ICUs are transfused on any given day. In the United States, 85% of patients with an ICU length of stay >1 week received at least 1 unit of PRBC transfusion, and the mean number of units of blood transfused per patient was 9.5. An observational study of 4892 patients admitted to ICUs in the USA throughout 2000 and 2001 found that almost 50% of patients were still transfused. The results also showed that initial PRBC transfusion tends to occur early in the ICU stay, with ongoing PRBC transfusions throughout the ICU stay. Blood transfusion in severely ill patients, whose Hb levels are low, is critical and also finding the risk factors preventing optimal increase the Hb is essential. Hence, this study aimed to evaluate the amount of Hb after PRBC transfusions in patients who were admitted to the ICU and some related factors. This cross-sectional study was conducted in the ICU Department of Isfahan Alzahra Hospital, Center of Iran, from March 2016 to February 2017. In this study, all patients hospitalized in the ICU of Alzahra Hospital (18–65 years old) who had to receive PRBC under doctor's supervision were enrolled in the study by convenience sampling method. The inclusion criteria were consist of patients admitted to the ICU, and needed PRBC transfusion (based on laboratory results of anemia (basal Hb < 8) and ICU physician opinion) and our study exclusion criteria consist of active bleeding during the time of blood transfusion, wound drainage during the time of blood transfusion, incomplete data, hematuria, gastrointestinal bleeding, and positive stool examination in terms of occluded blood and hemoptysis. The data collection tool was a two-part questionnaire, in which demographic information was recorded in the first part, and admission Hb level, mean blood volume transfusion during 7 days, Hb level at the 7th day of admission were recorded in the second part of the questionnaire. Furthermore, in the patients who had received PRBC based on doctor's prescription, the Hb level was measured at the time of infusion cell and 6 h later. Our primary outcome was changing Hb level after PRBC administrating and our secondary outcome was evaluating changing Hb level after PRBC administrating based on demographic and medical history. We calculated the mean increase in Hb level using the following method: (Hb level after 7 days – initial Hb level)/number of administered red blood cells (RBCs) units. Analysis of data was performed using (SPSS, Version 10.0, Chicago, Illinois, USA) statistical software. Descriptive statistics were reported as the mean and standard deviation (mean ± SD) for quantitative and frequency (percentage) for qualitative. Chi-square test was used for comparing categorical data between groups. We used the paired t-test for within-group analysis. Independent and ANOVA and Bonferroni post hoc test were used for between-group analyses. Paired t-test was used to compare data for the same patients over time. Moreover, Pearson correlation coefficient and multiple linear regression analysis were used for evaluating the association predictors with amount of increase in Hb after PRBC transfusions. All tests were analyzed at an error level of 5%. Of 124 hospitalized patients in the ICU of Alzahra Hospital who entered the study, 97 patients (78.2%) were males and 27 (21.8%) of them were females; the mean ± SD age of the patients was 41.87 ± 11.99 years. The average initial Hb level of patients was reported as 6.17 ± 1.43 g/dl and after administrating PRBC the Hb level was 8.09 ± 1.66 g/dl after 7 days (mean difference was 1.91 ± 1.93, t = 11.06, P < 0.001). It was also found that mean received PRBC of the patients was 4.23 ± 1.87 units during the 7-day period. No significant differences were found between change in Hb level based in terms of age, gender, underlying illness, body mass index (BMI), hospitalization history, fever, and duration of hospitalization (P > 0.05). However, there were significant differences between hospitalized patients in different wards (P = 0.002), in which the mean increased Hb level in hospitalized patients with internal disorders was the lowest (0.25 g/dl) and the highest amount was in the patients hospitalized due to infectious problems (0.7 g/dl) and the observed difference was related to patients in internal and infection wards (P = 0.003, Bonferroni test). Furthermore, the mean increased Hb level based on one unit of received PRBC in patients with initial Hb level <4 g/dl was the highest (0.7 g/dl), and the lowest (0.29 g/dl) was in patients with initial Hb level over 6 g/dl (P = 0.003) [Table 1]. Correlation coefficients between different variables and change in Hb are depicted in [Table 2]. There is a positive significant correlation between change in Hb level and number of received PRBC (r = 0.40, P < 0.001). Furthermore, multivariable linear regression analysis showed that positive association between Hb changes in terms of one unit of received PRBC remains statistically significant (B = 0.35, P < 0.001) [Table 3]. Anemia is a serious problem in the patients hospitalized in the ICU which increased morbidity and mortality. Thus, blood transfusion is necessary in severely ill patients with low Hb levels, and it is necessary to find risk factors that prevent the increase to the desired Hb level. The results of our study showed that the mean initial Hb level of patients was 6.17 ± 1.43 g/dl and this amount after receiving PRBC and after 7 days of initial Hb level test was 8.09 ± 1.66 g/dl. These changes were statistically significant (an increase of 1.91 ± 1.93 g/dl). It was also revealed that the mean received PRBC that patients obtained as 4.23 ± 1.87 units. The mean increased Hb level based on one unit of received PRBC and after 6 h after transfusion was equal to 0.44 ± 0.49 units. In a study by Valizadeh et al. it was clarified that the mean Hb level before admission in ICU was 11.1 g/dl, but some of the patients during admission in ICU required blood transfusion, which the mean Hb level before prescribing was 8.41 g/dl and blood transfusion volume was 7.82 units. A study of Crowinet al. showed that the Hb level before prescribing PRBC was 8.6 g/dl. This study also indicated that the highest blood transfusion volume was done in the 1st week and the minimum Hb level <9 g/dl was the predictor of increased mortality and duration of hospitalization. The results of one Zilberberg et al. study showed that 67% of patients experienced at least one blood transfusion and the average 12.9 units of blood was administered per patient during hospitalization. The number of transfused blood units in Zilberberg et al. 's study was more than the current study. While this amount in Volar et al. study on average was less than the number of transfused units in our patients, Gould et al. indicated that the receiver of the PRBC had worse outcomes than in those who had not received blood transfusions. Zilberberg et al. revealed that blood transfusion was accompanied with increased mortality, duration of hospitalization, and hospital cost. In our study, no significant relationship was found among the mean increased Hb levels and age, gender, underlying illness, hospitalization history, fever, BMI, and duration of hospitalization. However, it was determined that the increased Hb level in hospitalized patients due to internal problems based on one unit of received PRBC had the least amount (0.25 g/dl). In addition, the lower initial Hb level was equal to the higher rate of an increase in Hb level and the amount of received PRBC. Therefore, it can be seen that patients with a very low level of initial Hb received more PRBC, and thus, the increase in the amount Hb level was greater. In a study conducted by Thurer et al. in 2010, it was shown that the mean increased Hb was 1 g/dl. However, in our study, it was found that the mean increased Hb level based on one unit of received PRBC was 0.44 ± 0.49 g/dl. Furthermore, in the mentioned study, it was revealed that the rate of increased Hb among females was more than in males. However, we could not find a relationship between Hb level and gender. The reason for the difference in the increased Hb level in The two studies and an increased less than half of Hb in our study compared with favorable conditions revealed that some conditions occur in severely ill patients (hospitalized in ICU), in which blood transfusions could not increase the amount of desirable Hb. Naidech et al. 's study in 2008 showed that if the initial Hb levels were low, the Hb level increase in the blood transfusions would be higher. Our study was similar to the mentioned study obtained identical results. Although our study indicated that the low levels of Hb before injection required more blood transfusions, finally, more increase Hb level after the injection was observed. Based on available information, there is no study indicating the factors affecting the level of increase in the patients hospitalized in ICU after the injection. However, a study by Macciò et al. in 2005 showed that inflammatory factors including interleukin-1 beta, interleukin-6, tumor necrosis factor alpha, and C-reactive protein levels had a significant inverse relationship with Hb level. In a study by Tamer Abdullah Helmy et al. in 2014, it was indicated that inflammatory factors were increased in patients hospitalized in ICU, especially due to internal diseases (especially respiratory), and there is a direct relationship with admission to the ICU, duration of hospitalization in ICU, duration of hospitalization in general ward, and duration of ventilator device connection. Therefore, it can be seen that the lack of a favorable increase in Hb level in patients hospitalized in ICU due to internal disease is caused by the relationship between increased inflammatory factors and initial Hb level. We calculated the mean increase in Hb level using the following method: (Hb level after 7 days – initial Hb level)/number of administered RBCs units, which did not evaluate the patients' conditions or other factors affected the increase of Hb levels. Since this study was the first research regarding the evaluating process of different factors affecting the increased Hb level and because of the limitations of the survey such as being a cross-sectional study with ICU patients, who could not have appropriate contribution, therefore, we were unable to measure all possible factors that influenced the increased Hb level such as different medical history such as inflammatory factors and the course of patients illness during the hospitalization. Therefore, it is recommended to conduct a prospective study for assessing the effects of all possible factors in the absence of favorable increased Hb level in the patients hospitalized in the ICU. The results of our study showed that the increased Hb level based on one unit of received PRBC was low especially in patients with internal. Therefore, based on high frequency of anemia in ICU patients and relative complications, physicians should pay attention to factors affecting Hb levels after PRBC transfusion such as medical history. Therefore, for high-risk patients, we should administrate more PRBC to have better increase in Hb levels. This study has been supported by Research Deputy of Isfahan University of Medical Sciences, Iran (Research project number: 394651). This study was funded by a grant from Isfahan University Of Medical Sciences School Of Medicine. von Ahsen N, Müller C, Serke S, Frei U, Eckardt KU. Important role of nondiagnostic blood loss and blunted erythropoietic response in the anemia of medical intensive care patients. Crit Care Med 1999;27:2630-9. Shorr AF, Jackson WL. Transfusion practice in the ICU: When will we apply the evidence? Chest 2005;127:702-5. Chohan SS, McArdle F, McClelland DB, Mackenzie SJ, Walsh TS. 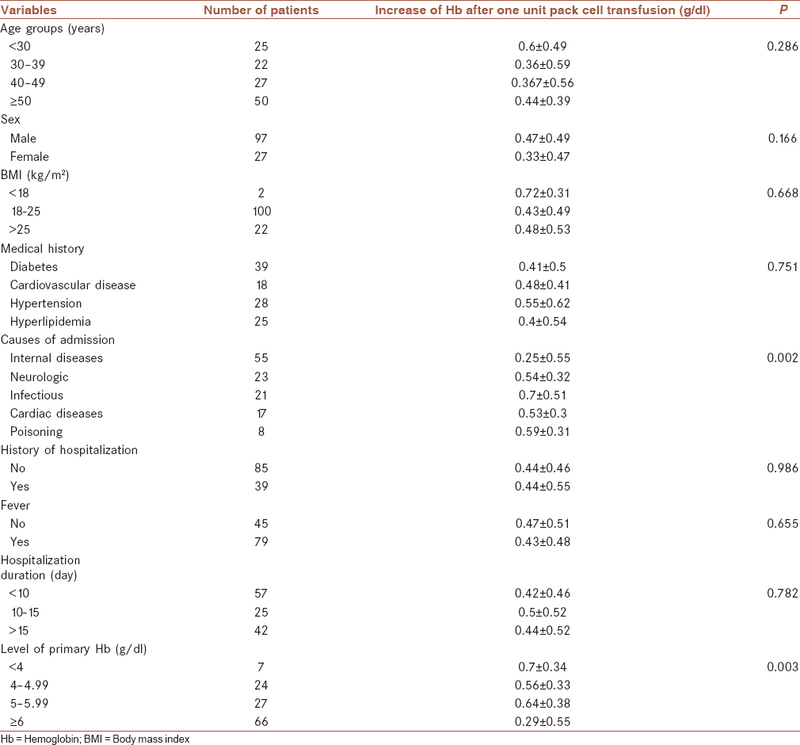 Red cell transfusion practice following the transfusion requirements in critical care (TRICC) study: Prospective observational cohort study in a large UK Intensive Care Unit. Vox Sang 2003;84:211-8. Corwin HL, Gettinger A, Pearl RG, Fink MP, Levy MM, Abraham E, et al. The CRIT study: Anemia and blood transfusion in the critically ill – Current clinical practice in the United States. Crit Care Med 2004;32:39-52. Vincent JL, Baron JF, Reinhart K, Gattinoni L, Thijs L, Webb A, et al. Anemia and blood transfusion in critically ill patients. JAMA 2002;288:1499-507. Lelubre C, Vincent JL. Red blood cell transfusion in the critically ill patient. Ann Intensive Care 2011;1:43. Hébert PC, Wells G, Martin C, Tweeddale M, Marshall J, Blajchman M, et al. Variation in red cell transfusion practice in the Intensive Care Unit: A multicentre cohort study. Crit Care 1999;3:57-63. Rao MP, Boralessa H, Morgan C, Soni N, Goldhill DR, Brett SJ, et al. Blood component use in critically ill patients. Anaesthesia 2002;57:530-4. Corwin HL. Anemia and blood transfusion in the critically ill patient: Role of erythropoietin. Crit Care 2004;8 Suppl 2:S42-4. Groeger JS, Guntupalli KK, Strosberg M, Halpern N, Raphaely RC, Cerra F, et al. Descriptive analysis of critical care units in the United States: Patient characteristics and Intensive Care Unit utilization. Crit Care Med 1993;21:279-91. Corwin HL, Parsonnet KC, Gettinger A. RBC transfusion in the ICU: Is there a reason? Chest 1995;108:767-71. Pearl RG, Pohlman A. Understanding and managing anemia in critically ill patients. Crit Care Nurse 2002; Suppl:1-12; discussion 12-4; quiz 15-6. Valizadeh MA, Mahori AR, Eishi A, Adeli H, Marzbani S. Prevalence of anemia and blood transfusion in patients in Intensive Care Unit. J Anaesthesiol Intensive Care Iran 2012;35:82-6. Crowin HL, Gettinger A, Pearl RG, Fink MP, Levy MM, Abraham E, et al. Anemia and blood transfusion in critically ill patient: Role of erythropoietin. CCM 2004;8 Suppl 2:S42-9. Zilberberg MD, Stern LS, Wiederkehr DP, Doyle JJ, Shorr AF. Anemia, transfusions and hospital outcomes among critically ill patients on prolonged acute mechanical ventilation: A retrospective cohort study. Crit Care 2008;12:R60. Volar AP, Maur AL, Binnekade JM, Schultz MJ, Juffermans NP. Determinants of transfusion decisions in a mixed medical-surgical Intensive Care Unit: A prospective cohort study. Blood Transfus 2009;7:106-10. Gould S, Cimino MJ, Gerber DR. Packed red blood cell transfusion in the intensive care unit: Limitations and consequences. Am J Crit Care 2007;16:39-48. Thurer RL, Katz RS, Parce P, Precopio T, Popovsky MA. By How Much Does a Single Unit Transfusion Increase the Recipient's Hemoglobin? Poster Abstract, Presented at AABB; 2010. Naidech AM, Kahn MJ, Soong W, Green D, Batjer HH, Bleck TP. Packed red blood cell transfusion causes greater hemoglobin rise at a lower starting hemoglobin in patients with subarachnoid hemorrhage. Neurocrit Care. 2008;9:198-203. Macciò A, Madeddu C, Massa D, Mudu MC, Lusso MR, Gramignano G, et al. Hemoglobin levels correlate with interleukin-6 levels in patients with advanced untreated epithelial ovarian cancer: Role of inflammation in cancer-related anemia. Blood 2005;106:362-7. Helmya TA, Baessb AI, Abdel Monsifc DA, Abdelhamid A, Elnasharty A. Role of C-reactive protein and interleukin-6 in predicting the prognosis of ICU-admitted patients with acute exacerbation of COPD. Egyptian Journal of Chest Diseases and Tuberculosis. 2014; 63: 829-35.